In Joe Fitzgerald’s world, mobsters are nothing compared to demons. In TEN GRAND, VOL. 1, created by J. Michael Straczynski (SIDEKICK, PROTECTORS, INC.), Ben Templesmith (FELL, 30 Days of Night) and CP Smith (Wolverine, Jonah Hex), a former mob enforcer, Joe, dabbles in demonology and soon finds himself caught in the middle of a struggle between the forces of light and dark with the fate of the world resting on his shoulders. 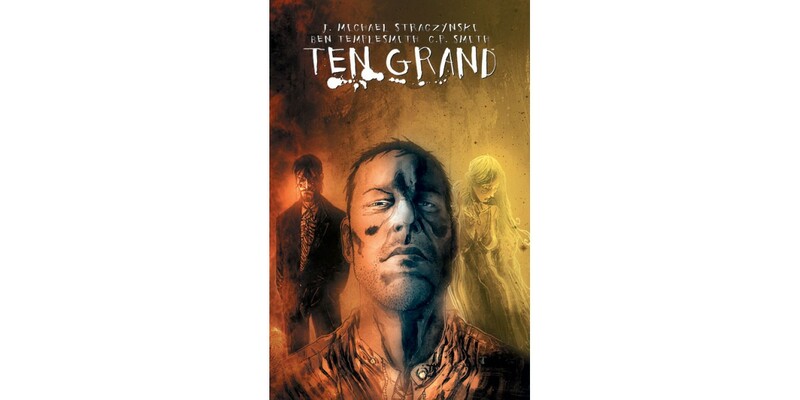 A twist on the classic Miltonian tale of Heaven and Hell at war with one another, TEN GRAND, VOL. 1 collects issues 1-6 of the series and provides fans with the first story arc just in time to jump in on the second half of the adventure starting with issue #7 in January. TEN GRAND, VOL. 1 is a dark and epic tale of one man’s journey to Hell and back and arrives in stores on 1/15 and is available for $12.99. Final orders are due from retailers on 12/2. TEN GRAND, VOL. 1 TP can be pre-ordered using Diamond Code SEP130560.